Remember that new serger I bought? I had an old quilt at home and decided to make a cover from it. Protection was needed, because I had a scheduled lesson from my dealer, and weather in this part of the world tends to be rainy/snowy right now. The lesson is another story. After owning a serger for at least 25 years, I knew my way around the old machine. In the 2 weeks between purchase and lesson, I had gotten fairly familiar with the new machine. I didn't learn anything at the lesson, and probably knew more than the person scheduled to teach me. Oh well, that's sort of what I expected, but you never know until you try. When I cut the new serger cover, I was on a roll, and cut a new cover for my hemmer. 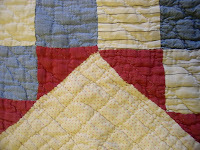 At this point, I realized that the quilt had been in good shape except for the binding. It was sewn by hand by my great grandmother and was near to 100 years old. It probably wouldn't have held up in use on a bed, because of the age of the fabric. Here's a close up picture. The hemmer still needs binding on the edges. I'll use unbleached muslin, but didn't have any in the shop that day. All I had was bleached muslin, which was too white. 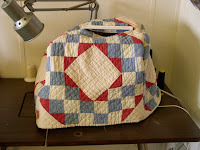 For the serger, I reused the quilt binding. If the edge gets raggedy, I'll redo it in unbleached muslin. A while ago, I showed you the ruffle for a gift sock. It was a beautiful ruffle, a great idea in theory! Then reality hit. A ruffle that size would not work on legs that walked, and that's the only kind that socks are good for. Also, the ruffle was too wide for the sock. Think, ...think...think... 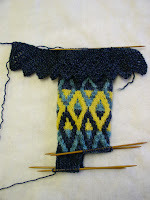 I could remove the ruffle, knit a new version, and graft it back to the sock. So that's what happened. 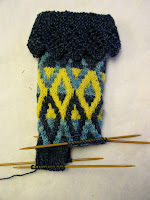 Remove the ruffle and put the sock on the smaller needles used for the ribbing. 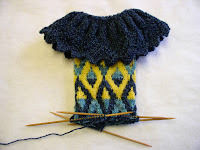 Knit a new lace cuff, using the lace edge from the ruffle. Graft new lace to the sock from the under side, so as to keep the purl turning ridge. 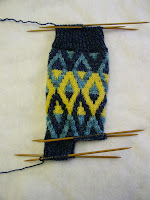 The surgery was successful, and I can knit the second sock to match. 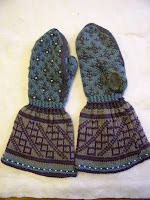 My favorite warm mittens, knit from an Anna Zilboorg pattern in Magnificent Mittens, and lined in alpaca, had holes in the thumbs from the leather leash used in dog walking. Last year, I darned them, but they neede repair again. Light bulb moment!!! Leather patches! (actually ultrasuede). Now applied over holes, and can be renewed as needed. The beads are fake pearls, which I don't recommend, because the finish wears off. She called for glass beads, I had lots of pearls. Birthday present, or Read the Instructions!! 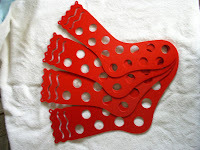 I saw these sock blockers online at The Loopy Ewe for a really good price. I ordered one in each size. Why was the price so good? When I opened the package, I had one sock blocker in each size, not one pair! Had I read further on the website, I would have seen the warning about the pricing. I twisted the arm of darling husband who didn't know what to buy for my birthday, and he bought them for me. He also said,"All right, buy another set just the same." The order has been placed.